For a number of years, rightly or wrongly the guess, it seems as if CW has given more to the UVic rugby program than what it has received in return. This season the tide has somewhat reversed, although this “giving” continues with the likes of White, Kratz, Masterton, Prevost, Cole, Carson, Robinson and Tate. The talent that CW has received in return has been more than instrumental in the critical three victories that the club has secured over the students. One of those players, Cam Polson, we have identified as an ‘Unsung Hero on the Field’. In recent years CW has had quality FRF however, fans have bemoaned the lack of a “difference-maker” in the boiler room. Cam Polson is giving us just that although, this statement is in no way to denigrate any other piano pusher who has played in this spot. CW: Cam, you have just joined CW this year after two seasons rest from your University days, welcome. What was the determining factor/s that made you decide to hang your cleats with The Tricolour? 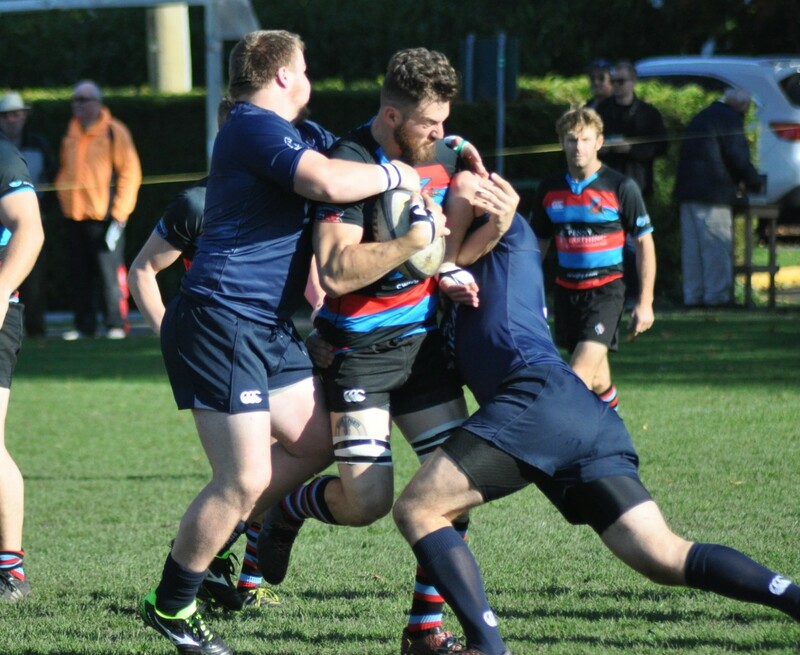 CP: Coming from UVic, I was very excited to join with a true club, not just a rugby program. The history, community involvements and positive social atmosphere of CW have always stood out to me and I have been looking forward to contributing for a long while. Since before I even actually arrived at the club, the CW community has been astoundingly welcoming and positive. I was reached out to by players and executives in a way that really inspires me. The club really went above and beyond for me, a guy who hadn’t played for a couple seasons due to injury, and so I want to return the favor and play my hardest every week for the club. I’m definitely a competitive player too though, so I want to be a part of a team that has a real shot at taking home hardware at the end of the season. When you throw it all together, CW was the obvious choice! CW: What were a few highlights from your playing days at UVic? CP: I was fortunate to have done enough victory laps through UVic to allow me to train and play alongside incredible players from a couple of eras. When I arrived there in my first year, guys like Pat Riordan and Adam Kleeberger were still with the program and by the time I left Doug Fraser and Pat Kay were lighting it up. The fact that a lot of U.Vic’s best are choosing, like I did, to suit up with CW is really fantastic. We were also able to go on a few really great tours while I was there, primarily to play sevens in Las Vegas and 15`s in Oregon. Both those tours had great results for us on the pitch, and got hilariously out of hand when we were left unsupervised. I’ll always be happy and appreciative to have played for the Vikes. CW: At what age did you start playing rugby and what teams have you played for? Have you always played lock? CP: I first started playing mini rugby at Velox when I was seven, right after my family moved to Victoria. My dad is a huge rugby fan and former player, so he got me and my brothers stuck in as soon as the youth program started up there. I played for Claremont Secondary and Prince Alfred College in Adelaide, Australia when I was a teenager, as well as the Crimson Tide. Then I was with the RMC Paladins in Kingston and transferred to play for UVic in 2008. I’ve had (very) brief moments of exhilaration playing in the back row over the years, and Scott Manning even dangled the #8 carrot for a split second in this year’s opening match against Westshore, but I’ve learned better than to get attached to a number other than 4 or 5. Polson’s seem pre-destined to be locks and my family will confirm that. But what’s not to love about the engine room? CW: What are your rugby aspirations? CP: I want to play rugby as long as my body will allow, or until the club tells me politely to leave. But for now, my primary long-ish term goal is to play in the CRC. I joined a wildfire crew five years ago and have since been unavailable to play during the summers, so now that I’ve got my roots firmly planted back in Victoria I’m trying to earn the opportunity to try out for a provincial team again. Obviously I want to play at the highest level I can and every rugby kid’s dream is to represent his/her country someday, but I’m really just focused on improving my game one little bit at a time. The calibre of coaching and in-house competition for spots at CW is really adding to my development and for that I’m really grateful to the club. CW: What are you working at for a living at the moment? What are your career aspirations? CP: I’m currently working for Phillips Brewing & Malting Co., where my main focus is resisting free beer when I should be going to the gym. My goal is to someday become a structural firefighter in Victoria though, which is something I’m chipping away at every chance I get. CW: CW has a new coach this year and he has brought with him a high energy and enthusiastic style. What have you enjoyed about the season so far? CP: I really enjoy playing for Scott and do my best to match his professionalism and enthusiasm with my own. As a player there are certain coaches that you just want to win for and Scott is certainly one of them. It’s refreshing to have a structured plan of attack, but also be trusted by the coach to just “go with your gut” and play freely when the game allows for it. On top of that, the game analysis, video and blunt critiques we receive on top of our usual training really keeps rugby as a focus even on our off days which I strongly believe is having a really productive impact. We can tell Scott cares about the club and loves what he does; so far it’s been a great fit from my perspective. CW: Finally, you have had enough time to get a sense of what might be achieved as a team, this season. No doubt, the “coming and going” of key pieces is nothing new to you. Conservatively, what do you think some realistic outcomes could be? CP: Conservatively and realistically, I don’t see any reason why CW couldn’t be in the BC Premiership final. I know that everyone says their team can go all the way, but right now we’re sitting in first place on the island, have a stacked bench, and committed players from top to bottom. I think it’s really going to be up to us, not our competition, how far we make it this season. When we play the style and pace that we want to, there’s real brilliance on the pitch from a lot of guys. Where we run into trouble occasionally is when we allow ourselves to get sucked into playing the opposition’s format, but we’re all aware of it and it’s nothing that we can’t avoid with a little sharper mental focus. The support network that comes with being a CW member also has a colossal influence on the success of our team, and I would like to deeply thank everyone who helps us from the sidelines. I’m really, truly excited and appreciative to be a small cog in the CW machine this year, and I’m confident it’s within our grasp to add something new and shiny to the clubhouse wall! Obviously, a class act on and off the pitch! Thanks for taking the time for this interview, Cam. Our best wishes go to you for an injury-free and enjoyable season.